Hospital advertising is all about earning the attention and trust of the community the hospital intends to provide care for. This kind of advertising can be difficult, however, as it’s challenging to market a hospital as a business while still maintaining the genuine, personalized investment people want to see from their healthcare providers. While digital marketing is the driving force behind modern marketing sensibilities, it’s not the only force to invest your resources in. With so many companies and outlets vying for attention in the highly competitive digital space, it can be expensive to make your brand stand out from the crowd. This is where physical outdoor advertising comes in. While a hospital’s marketing strategy should definitely include a digital component, physical out-of-home ads might hold the key to really connecting with a community and providing for its unique needs. The catch with a physical advertisement is that it has to be situated in areas where the intended audience will be able to see and interact with it on a regular basis. Without this consistent interaction, a physical advertisement loses most of its power and fades into obscurity. This is why it’s important to study a community and determine where people spend their time and where they would be comfortable being marketed to. One such place is a local supermarket. By advertising your hospital in the community supermarket, you ensure that a large percentage of your community’s population will be exposed to the ad. When a hospital focuses its advertising on a local, personal level, it examples the kinds of care and investment it can offer its patients. Messaging can be hyper-localized to truly speak with the community within your service area and to show that you too are a part of the neighborhood fabric. Messaging to shoppers all year long will ultimately go a long way towards developing a healthy reputation for the hospital and its services. Everyone needs to eat, and since most restaurants are seen as a luxury, most people cook at home in order to save money. This means that they need to go grocery shopping each and every week as part of their deeply ingrained routine. Because of this, the supermarket can become a hub of community interaction. That means advertisements and promotions located in a supermarket are guaranteed consistent and repetitive exposure with great frequency. With so much traffic going in and out on a regular basis, supermarkets can be one of the best places for your hospital to set-up a consistent marketing strategy. Advertisements shouldn’t be invasive, however, as that will alienate an audience, but rather, be supportive of an audience’s lifestyle. One of the best ways to do this is by marrying your advertisements with practical, helpful services. 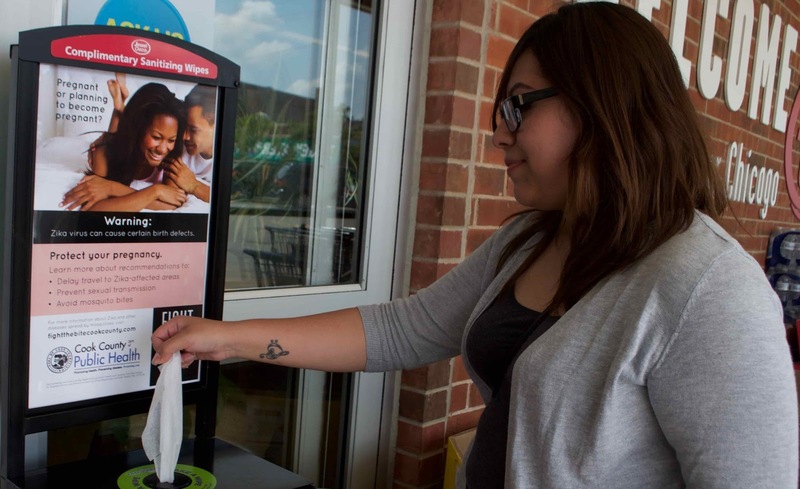 For example, providing local supermarkets with entrance wellness kiosks that offer free hand sanitizer or cleaning cart wipes is both a great form of marketing - as the kiosk can be adorned with your hospital's logo and imagery - and a genuine investment in the community, as it offers shoppers a health service they can benefit from with no-strings-attached. Shoppers actively engage with the kiosks as they enter the store allowing your eye level messaging to truly resonate and stick with them each and every week. These wellness kiosks act as an engaging billboard, providing customers and your brand with a boost of positive perception. Another productive option is to simply purchase ad space on supermarket grocery carts. These kinds of advertisements function as mini-billboards and provide complimentary visibility and interaction without invading a buyer’s personal space. They can be completely customizable to best suit your hospital's unique message and can earn the kind of headspace that will make it that much easier for your hospital to exist in the forefront of someone’s mind. The supermarket is a staple of every community, and when you emphasize your physical out of home marketing strategies there, you’re providing the kind of ground-level, genuine investment in a community that every hospital should exemplify.